I love latkes, crispy little potato cakes, fried in organic beef fat. The key to crispy here is to use only beef fat! Any other fat is not going to make them as crispy. 1) Lightly salt the potatoes and onions after grating them in a food processor or with a box grater and let them drain a bit in a mesh colander. 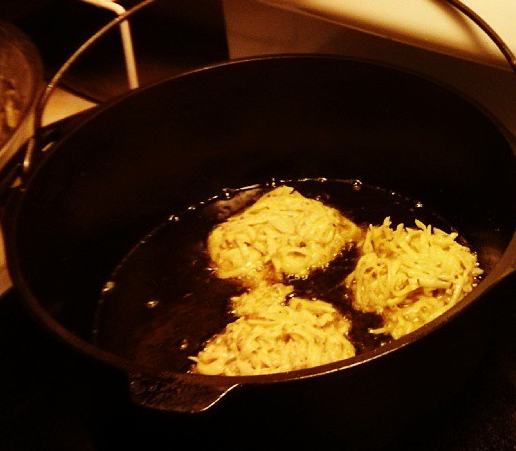 2) Heat the beef fat to medium heat, the fat should be sizzling before you add the latkes. 3) Mix drained potatoes and onion with flour, salt and pepper, garlic if desired..and let sit while fat is heating, about 10 minutes. 4) Form into little 3 inch patties, rather flat on both sides. Let them slide off of the ends of your fingers into the fat. 5) You will be able to tell when they are ready to start watching to turn because the you will see the edges browning nicely. Carefully flip and continue to brown on other side. 6) Drain well either on paper or a drying rack, them serve with ketchup, rice sour cream..or applesauce.